This charming executive rental has been designed to meet the needs of the business traveler both inside and out. When you enter this third floor, one bedroom, private condominium, you will immediately appreciate the open floor plan connecting the living room, dining area and open kitchen. 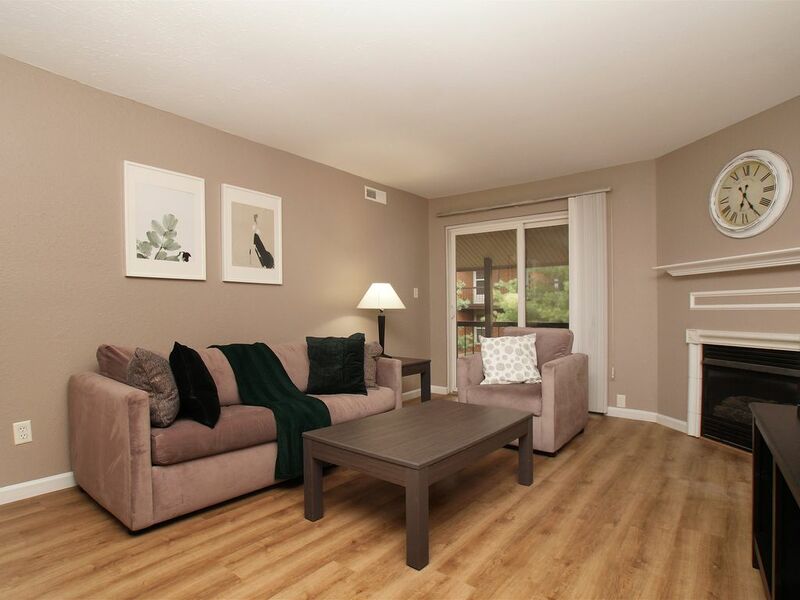 The living room is accented by a gas fireplace and slider door access to your private balcony. Contemporary and comfortable, all at the same time, the property is fully furnished with a completely accessorized kitchen and sofa sleeper for possible guests. For your convenience the washer and dryer are located within the unit. The bedroom has been furnished with a queen size bed. Open parking is available throughout the complex. This residence is newly upgraded with wood style floors throughout. Location, Location, Location! Greenbriar condominiums are a quiet community located in the trendy Kirkwood, MO neighborhood perfect for dining and shopping. Located near Big Bend and I-270 there is easy access to the highway. This community offers everything you need from walking trails, community pool, party cabana, clubhouse, two tennis / basketball courts, a pond and exercise facilities all included in you monthly rent. The clubhouse offers an elegant party room, full sized kitchen, free Wifi and fitness center. Kirkwood, MO was established in 1853 and has long been known for its down-home charm, community pride, nationally recognized schools, vibrant business community and unique restaurants. This is a great lodging option for corporate travelers. Rental rate includes gas, electric, water (with cap) internet, cable, phone and all furnishings. Guests are invited for 30-day stays and longer. Location, Location, Location! Located near Big Bend and I-270 there is easy access to the highway. This community offers everything you need from walking trails, community pool, party cabana, clubhouse, two tennis / basketball courts, a pond and exercise facilities all included in you monthly rent. The clubhouse offers an elegant party room, full sized kitchen, free Wifi and fitness center.